Story: Papa was a rolling stone and wherever he hung his hat was his home. So why don't you hang a pair of Elmore sunnies on your face and get rambling on your mind so you can roll out the old school way. 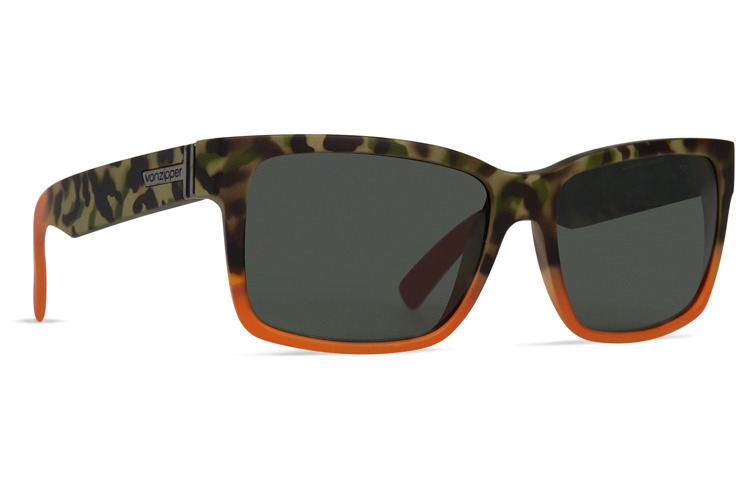 Specs: VonZipper Elmore sunglasses are handmade in Italy; the frame is crafted from nylon grilamid and held together with stainless steel optical hinges. The base 6 spherical impact resistant polycarbonate lenses will protect your eyes with 100% UV protection. I have owned 8 different Elmore sunglasses - currently have 5 colors that I switch off daily. Black/white frames get the most compliments! I’m nursing along my second pair since you don't make that color frame anymore! 5 years later and people still ask about them. Bring back the funky colors- Spaceglaze and Vibrations! Need more colors! Red, White and Blue was an awesome addition! These are my favorite shades! Awesome styling! Many compliments! Keep them coming! It was time for me to ditch the wrap-around sunglasses that I've had since the 90's and get something that would look better in various settings. I originally went with a pair of Fultons because of Iron Man 3, but they didn't fit me well because I have a wide, round face so, after checking out some reviews I ended up buying a pair of Elmores, which are basically the same thing, only bigger, and I love them! I live on a tropical island, and I wear them all of the time! Definitely, getting the other versions of this great pair of sunglasses! I have been a fan of VZ shades since I first laid my eyes on them. I started with the Kickstands and Sham styles now I sport these Elmores, before that Fultons. I especially love the Battlestation version of their collection. I have several colors of this model, I try to rotate as much as I can but the black and gold battlestations I have are my go to ones most often, they also have the most expensive look to them, I think... reminds me of something that someone's dad who has good taste would wear, GQ style... Love these! I drive in Florid and these von zipper polarized are the best sunglasses to reduce the glare. I even wear them during rainstorms as I can see the traffic more clearly. I've had these for several years and they're like new. I also have a big head and these look great on me. Receive many compliments. One of my all time favorites. I wish Von Zipper would bring back some of the old colors. I've owned 4 pairs over the years and bought 1 for my brother. Yet the first pair I bought was a clear frame with a rainbow lens which I loved the most. Keep them coming V.ZIP never discontinue. Absolutely the best sunglasses on the market! Been wearing them for years. Can't imagine myself wearing a diffrent pair of sunglasses. By Far the best pair of glasses from VZ. I probably purchased 4 of these in the same style, but different colors. Wide frames are always a crowd favorite. Hands down best sunglasses around! Most favorite sunglass EVER! Been wearing them for like 8 years now! I hope they never discontinue these! love these shades! please do a throwback to the facemelt & smoke out frame/lenses please!!!! need some crazy lenses & frames again all you all have now are standard frame & lense colors!!!! I've been buying these glasses since I first found them, I almost want to say its been 7 years now. I have gone through many pairs of them, I got one pair that was warped (not like the vans tour) and I let VZ know and they said they would replace them no problem but they got stolen...I guess it was never meant to be. I can say this though, you can put these through some abuse a pair normally lasts me about 1 and a half years before the scratched lenses are done, or I lose them, or your angry girlfriend comes home and steps on them and then melts them down to hide the evidence. Can say I recommend these to everyone.